1Universidad Autónoma de Chihuahua, Facultad de Ciencias Agrotecnológicas, Escorza 900. Col. Centro. 31000. Apartado Postal 24 Chihuahua, Chihuahua, México. *Corresponding author (dojeda@uach.mx). 2Centro de Investigación en Alimentación y Desarrollo, A.C. Av. 4ta Sur 3820, Fracc. Vencedores del Desierto. 33089. Cd. Delicias, Chihuahua, México. Carbonic anhydrase (CA) (EC: 2.4.1.1) catalyzes the rapid conversion of carbon dioxide plus water into a proton and the bicarbonate ion (HCO3-) that can be found in prokaryotes and higher organisms; it is represented by four different families. Carbonic anhydrase is a metalloenzyme that requires Zn as a cofactor and is involved in diverse biological processes including pH regulation, CO2 transfer, ionic exchange, respiration, CO2 photosynthetic fixation, and stomatal closure. Therefore, the review includes relevant aspects about CA morphology, oligomerization, and structural differences in the active site. On the other hand, we consider the general characteristics of Zn, its geometry, reactions, and physiology. We then consider the CA catalysis mechanism that is carried out by the metal ion and where Zn acts as a cofactor. Zinc deficiency can inhibit growth and protein synthesis, and there is evidence that it reduces the CA content in some plants, which is a relationship addressed in this review. In leaves, CA represents 20.1% of total soluble protein, while it is the second most abundant in the chloroplast after ribulose 1,5-disphosphate carboxylase/oxygenase (RuBisCO). This facilitates the supply of CO2 to the phosphoenolpyruvate carboxylase in C4 and CAM plants and RuBisCO in C3 plants. Key words: Cofactor, metal ion catalysis, metalloenzyme, zinc deficiency, CO2 transfer. La anhidrasa carbónica (CA) (EC: 4.2.1.1) cataliza la conversion rápida de dióxido de carbono más agua en un protón y el ion bicarbonato (HCO3-); la cual puede encontrarse en procariotas y en organismos superiores y está representada por cuatro familias distintas. La CA es una metaloenzima que requiere Zn como cofactor y está implicada en diversos procesos biológicos, incluyendo la regulación del pH, la transferencia de CO2, intercambio iónico, la respiración, la fijación fotosintética de CO2, y el cierre estomático. Por lo cual, la revisión incluye aspectos relevantes sobre la morfología de laAC, su oligomerización y diferencias estructurales en el sitio activo. Por otro lado, se consideran las características generales del Zn, su geometría, las reacciones en que participa y su fisiología. Posteriormente se aborda el mecanismo de catálisis de la AC, el cual se lleva a cabo por ion metálico, donde el Zn actúa como cofactor. La deficiencia de Zn puede inhibir el crecimiento y síntesis de proteínas. Además, existen evidencias de que la deficiencia de Zn reduce el contenido de la AC en algunas plantas, de ahí la relación abordada en la presente revisión. En las hojas, la AC representa el 20,1% de la proteína soluble total y en el cloroplasto es la segunda en abundancia, después de la ribulosa 1,5-bisfosfato carboxilasa/oxigenasa (RuBisCO). Esto facilita el suministro de CO2 a la fosfoenolpiruvato carboxilasa en plantas C4 y CAM y a la RuBisCO en las plantas C3. Palabras clave: Cofactor, catálisis por ion metálico, metaloenzima, deficiencia de zinc, transferencia de CO2. Plant physiology depends on diverse metabolic processes involving a large number of enzymes which, in turn, also depend on other elements such as cofactors or coenzymes to be activated and catalyzed. One of the many enzymes involved in physiological processes is carbonic anhydrase (CA). In plants, CA helps to elevate CO2 concentration in the chloroplast to increase the carboxylation rate of the RuBisCO enzyme (ribulose 1,5-disphosphate carboxylase). This is the reaction that incorporates CO2 into carbohydrates during photosynthesis and can only use the C in CO2 instead of carbonic acid or bicarbonate. There are several forms of CA in nature; in the case of plants, we find |3 carbonic anhydrase, which is a metalloenzyme that requires Zn2+ for its activity. The catalytic mechanism of CA is achieved by the metal ion, and a characteristic of metal ion catalysis is manifested by CO2 hydration through a mechanism binding Zn to hydroxide (Kimber and Pai, 2000). Zinc deficiency may inhibit growth by reducing the available Zn content in the plant, which directly affects metabolism by altering the balance of other nutrients in the plants, such as iron, P, and Cu. The effect of Zn deficiency in CA cannot be selective because it causes a general decrease in protein synthesis. However, the association of Zn with CA has been reported years ago in crops such as Pisum sativum L., Lactuca sativa L., Petroselinum crispum (Mill.) Fuss, and Spinacia oleracea L. (Tobin, 1970). Subsequent studies also report such associations of Zn with CA in pecan Carya illinoinensis (Wangenh.) K. Koch (Snir, 1983) and rice (Oryza sativa L.) (Sasaki et al., 1998). Although studies have been performed with CA, it is not being used in a practical way as a nutritional diagnostic test to detect Zn deficiency. Thus, this paper aims to differentiate the biochemical processes that exist between CA and Zn in plant physiology, as well as the theoretical elements needed to develop and implement new nutritional diagnostic techniques that establish the state of the art on this matter with the hope of benefits for technological development. Carbonic anhydrase or carbonate dehydratase (CA, EC: 4.2.1.1), is a type of enzyme that catalyzes the rapid conversion of CO2 over water in a proton and bicarbonate ion (HCO3-). This reaction is quite slow without the CA biological catalyst since the reaction with the enzyme is normally conducted from 10 thousand to 1 million times per second (Hewett-Emmett and Tashian, 1996). Carbonic anhydrase was found in bovine erythrocytes by Meldrum and Roughton in 1933 and Neish accidentally discovered the first p carbonic anhydrase as a component of the chloroplast of the plant leaf in 1939. Only CA families have been well characterized as catalysts in cells and tissue in all forms of life. Based on its amino acid sequence of carbonic anhydrases (CAs), it can be classified into three separate families designated as alpha, beta, and gamma (Hewett-Emmett and Tashian, 1996). It should be noted that plant leaf chloroplast CA was not recognized as a different form of CA, evolutionary and structurally, until five decades later with the advent of DNA sequencing. At that time, it was the second known evolutionarily different form of CA and was therefore designated as p. Since 1990, many authors have shown the presence of p-CA not exclusively in photosynthetic organisms, but also in eubacteria, yeast, and archaea species (Smith and Ferry, 2000; Moroney et al., 2001; Elleuche and Poggeler, 2009). Demonstrating the physiological role of β-AC has been somewhat elusive, although it is likely to be a very imβortant accessory enzyme for different dependent processes of CO2 or HCO3- such as processes that include other enzymatic reactions, e.g., catalysis carried out by RuBisCO in chloroplasts, kinase in Escherichia coli (Guilloton et al., 1992), Helicobacter pylori urease (Nishimori et al., 2008), and bicarbonate-dependent carboxylase in Corynebacterium glutamicum (Mitsuhashi et al., 2004). Beta-CA is an essential component of carboxysome, an organelle with high CO2 concentrations in cyanobacteria. Some β-AC mutations have produced a phenotype that requires high CO2 concentrations for growth (Fukuzawa et al., 1992). It has also been shown that β-CA is essential for the growth of E. coli (Merlin et al., 2003), C. glutamicum (Mitsuhashi et al., 2004), and Saccharomyces cerevisiae (Gotz et al., 1999). Under aerobic conditions and atmospheric CO2 concentrations, it has been demonstrated that the native type or variants of the catalytic component of β-CA in S. cerevisiae can restore the organism's ability to grow under aerobic conditions (Clark et al., 2004). After recognizing the existence of β-CA as a structurally independent form of the enzyme, it took a decade to get a crystal structure of a β-CA X-ray. This was mainly because β-CAs in plants are somewhat difficult to handle and very sensitive to air oxidation. The first report of the β-CA X-ray structure was the red algae Porphyridium purpureum (Mitsuhashi et al., 2000). This was quickly followed by the structure of the Pisum sativum plant (Kimber and Pai, 2000) and E. coli bacteria (Cronk et al., 2001). All CAs a/β share a fold that is not found in other proteins. Although β-CAs can have a variety of oligomeric states, their molecular masses range between 45 and 200 kDa, and the fundamental structural unit of the β-CA appears as a dimer or its structural equivalent (Mitsuhashi et al., 2000). Just like any other kind of CA, β-CA exposures show a broad structural and functional diversity. All β-CAs share a common structural element, which is a parallel central β sheet made up of four filaments 2-1-3-4 arranged within each monomer or pseudo-monomer. The fundamental dimer is closely intertwined, and there are extensive monomer-monomer contacts in the region where it joins with the β sheet. Almost all β-CAs are structurally characterized by a Zn ion in each monomer or pseudo-monomer (Figure 1). The Zn ion is found in a pseudo-tetrahedral environment of the Cys2His (X) coordination type, where X is water, an anion, or an Asp residue. This Zn ion defines the active site of the enzyme (Krissinel and Henrick, 2007). Figure 1. Ribbon diagram of carbonic anhydrase fundamental structure obtained by X-ray crystallography, which is manifested as a dimer with monomers shown in orange and green. The Zn ions are shown as magenta spheres (Kimber and Pai, 2000). The β-CA structures obtained by X-ray crystallography can be classified into two different structural classes based on the organization of the active site in their uncomplexed state, referred to as "type I" and "type II" β-CAs. The main difference between these two types of β-CAs is the binding of Zn ions to the active site, and the orientation and organization of the surrounding residues (Figure 2). Type I β-CAs are distinguished by the following characteristics in the active site: (1) a set of four spherically arranged Cys2His (X) coordinates where X is an interchange ligand (e.g., acetate, acetic acid, water), (2) an Asp-Arg pair that guides the Asp residues into acceptng a hydrogen bond of interchangeable atoms that are directly linked to Zn ions, (3) a donor hydrogen bond able to interact with a Zn bicarbonate ion in the interchangeable position of the ligand, and (4) a narrow and hydrophobic cleft along the dimer interface or pseudo-dimer that leads to the Zn ions of the active site (Covarrubias et al., 2005; Rowlett, 2010). Type II ß-CAs are characterized by the following distribution in the active site: (1) a closed system of four Cys2HisAsp coordinates forming a coordination sphere with Zn, (2) an Asp-Arg fracture, (3) the lack of a hydrogen bond donor (e.g., Gln or the equivalent of Gln151) able to interact with a bound bicarbonate ion consolidated in the Asp position, and (4) a narrow and hydrophobic cleft along the dimer interface or pseudo-dimer that leads to the Zn ions of the active site (Covarrubias et al, 2005; Rowlett, 2010). Figure 2. Structural differences of the β-carbonic anhydrase active site: Type I and Type II (Rowlett, 2010). Enzymes usually have multiple forms by varying their molecular mass and metabolism regulation activities. These forms are called isoenzymes; they play a major role in the adaptation of organisms and are used as biochemical co-dominant markers to identify genotypes and establish phylogenetic relationships among different groups of taxa. Carbonic anhydrase isoenzymes have been determined in the 24 monocot and dicot plant species (Atkins et al., 1972). In biological systems, proteins rarely act alone and usually bind to other biomolecules (often other proteins) to form oligomers and provide cellular-specific responses. We talk about homo-oligomers if the subunits are identical and hetero-oligomers if they are different. Many of these protein-protein associations are involved in diverse chain reactions in the cellular processes. Among the oligomeric forms found in nature that structurally characterize β-CA are dimers, tetramers, and octamers (Figure 3). The state of oligomerization seems to be driven by surface extensions or unique elaboration of the secondary structure of the p-CA core (Kimber and Pai, 2000; Krissinel and Henrick, 2007). Figure 3. Oligomeric forms of β-carbonic anhydrase (Rowlett, 2010). The atomic number of Zn is 30; it works with a valence of +2 and an atomic weight of 65.37 u.ma, an electron configuration [Ar] 3d10 4s2 belonging to period 4 and group IIB (Williams, 1987). Zinc is a metal that is sometimes classified as a transition metal, although strictly speaking it is not since Zn and its type of device have full d orbitals. This element resembles Mg and Cd in their group, but Hg is far away due to its unique physical and chemical properties (lanthanide contraction and powerful relativistic effects on linking orbitals). It is a chemically active metal; it produces a blue greenish flame when burning that releases Zn oxide as smoke (Barak and Helmke, 1993). It is number 23 in the list of the most abundant elements on earth and has five isotopes: 64Zn (48.63%), 66Zn (27.90%), 67Zn (4.90%), 68Zn (18.75%), and 70Zn (0.62%). In plants, it has been reported that there are fractions of heavy isotopes in the roots and light isotopes in the shoots (Weiss et al., 2005). Zinc in solution is in the +2 oxidation state and, unlike Cu+2 and Fe+2, is electronically stable under physiological conditions as a result of its electrons being in the complete d orbital (Auld, 2001). In addition, Zn+2 has strong characteristics of Lewis acid due to its small load radius (0.83 A), and it can form strong covalent bonds with S, N, and O donors (Barak and Helmke, 1993; Auld, 2001). Zinc forms many soluble salts including halides, sulfates, nitrates, formates, acetates, thiocyanates, perchlorates, fluorosilicates, cyanides, zincates with alkali metals, and Zn-ammonia salts. On the other hand, it also forms moderate soluble compounds including Zn-ammonium phosphate, Zn hydroxide, and Zn carbonate, along with a series of soluble and insoluble organic compounds (Barak and Helmke, 1993). The inherent chemical potential and reactivity of Zn are not exceptional compared to other metals. However, unlike other transition elements from the first row metals (e.g., Sc2+, Ti2+, V2+, Cr2+, Mn2+, Fe2+, Co2+, Ni2+, and Cu2+), the Zn ion (Zn2+) contains the full d orbital (d10) and therefore, does not participate in redox reactions, but rather acts as a Lewis acid by accepting a pair of electrons (Williams, 1987). This lack of redox activity produces a stable Zn2+ ion in a biological sense where the potential is in constant flux. Therefore, the Zn ion is an ideal metal cofactor for reactions requiring a stable redox ion to function as a Lewis acid and as a catalyst in proteolysis and CO2 hydration (Butler, 1998). In addition, due to the filling of the d orbitals, Zn2+ has zero ligand field stabilization energy in all its geometries; therefore, its geometry is inherently more stable than other transition elements (Huheey et al., 1993). This lack of an energy barrier in the coordination geometry can be used by Zn metalloenzymes to alter metal-ion reactivity and can be an important factor in the ability of Zn2+ to catalyze chemical transformations accompanied by changes in the coordination geometry of the active site. In all the Zn metalloenzymes studied so far, the most often observed binding geometry is a slightly distorted tetrahedral (Figure 4) with the metal ion coordinated with three or four protein side chains. However, in other Zn metalloenzymes, another type of geometry has been observed (McCall et al., 2000). Figure 4. Geometry of zinc (McCall et al., 2000). In the Zn protein binding sites, the Zn ion is coordinated by different combinations of the protein side chains (Gregory et al., 1993). In Zn proteins, the role of the Zn ion is important and can be catalytic, co-catalytic, or structural. In a catalytic Zn site, Zn ions directly participate in the reaction. There are several metal ions in close proximity to each other in a co-catalytic Zn site where Zn plays a catalytic role, while the other metal ions enhance the site's catalytic activity. Finally, in structural sites, Zn ions mainly stabilize the tertiary structure of the enzyme in a manner analogous to the disulfide bonds. In all cases, eliminating Zn can lead to a loss of enzymatic activity (Vallee and Auld, 1993). 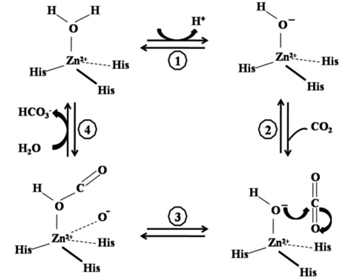 Water bound to Zn is a crucial component to activate the catalytic site since it can be ionized to form a hydroxide bridge (as in CA), polarized by some base to generate nucleophilic catalysis, or displaced by the substrate (Figure 5). In Zn hydrolases and lyases, such as Zn and CA proteases, the Zn ion acts as a powerful electrophilic catalyst (McCall et al., 2000). Figure 5. Simplified configuration of zinc reactions with water. The mechanism controlling Zn homeostasis is not exactly known yet (Hacisalihoglu et al., 2004; Broadley et al., 2007; Kramer et al., 2007). However, it has long been acknowledged that Zn is essential for cell physiological processes (Barak and Helmke, 1993) by influencing different processes as a micronutrient in plants (Figure 6). Figure 6. 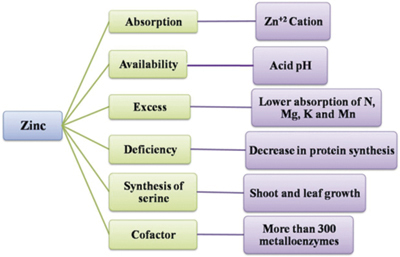 Simplified diagram of Zn as a plant micronutrient (Sagardoy et al., 2008; Srivastava and Singh, 2009). On the other hand, in order for Zn absorption to occur, we have to consider several factors (Figure 7) since micronutrient availability is a function of the "form" in which it is found in the soil that determines its "mobility" towards the roots of plants (Ojeda-Barrios et al., 2009). It has also been observed that in alkaline soils with a pH ranging from 7 to 8.6, Zn is bound by the bicarbonate ion that forms ZnCO3, which is very insoluble. This is why applying Zn to the soil is not effective and restricted only to non-calcareous soils (Perea-Portillo et al., 2010). Figure 7. 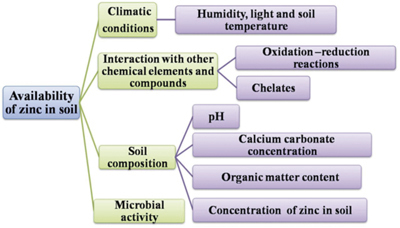 Simplified diagram of factors that influence soil Zn availability (Alloway, 2004). After being captured, Zn is transported through the xylem where it is chelated by various small molecules (Haydon and Cobbett, 2007) including organic acids such as citrate (Broadley et al., 2007), malate, and nicotinamide (Callahan et al., 2006). When the Zn supply is high, much of this nutrient is also chelated in the cell by organic acids such as malate and citrate (Kupper et al., 2004), amino acids such as histidine (Callahan et al., 2006), phytates, and metallothionein (Papoyan and Kochian, 2004), and the rest is stored in the vacuole (Srivastava and Singh, 2009). Otherwise, different symptoms can be observed when there is Zn deficiency (Figure 8). Figure 8. Simplified diagram with zinc deficiency symptoms (Perea-Portillo et al., 2010). The active site which binds the enzyme contains a Zn ion (Zn2+) that reduces pKa and allows the nucleophilic attack on CO2. 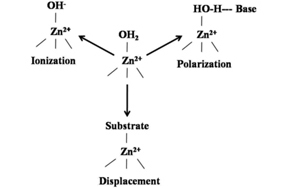 In biological systems, Zn is found only in the +2 oxidation state. A Zn atom is always bound to four or more ligands; in CA, three coordination sites are occupied by the imidazole rings of three histidine residues and an additional coordination site is occupied by a water molecule (or hydroxide ion, depending on pH). The global burden of the Zn (His)3 complex remains as +2 since all the molecules that occupy the coordination sites are neutral. Catalysis supposes that Zn activates water. It was determined by observing the pH profile in enzymatically catalyzed CO2 hydration where changes in pH alter the hydration speed of CO2 catalyzed by β-AC. The enzyme activity is at a maximum at high pH, up to pH 8, where the reaction is near its maximum speed. When pH decreases, the reaction speed decays. The midpoint of this transition is near pH 7; although many amino acids, mainly histidine, have pka values near 7, evidence suggests that the group responsible for this transition is not an amino acid without the zinc-bound water molecule (Stryer et al., 2008). The union of a water molecule to the positively charged Zn site reduces the water molecule pka from 15.7 to 7. With neutral pH, an important concentration of hydroxide ion (zinc-bound) is generated, which is sufficiently nucleophilic to attack the CO2 much faster than water. The importance of this zinc-bound hydroxide ion suggests a simple mechanism for CO2 hydration. A feature of metal ion catalysis is exhibited by CO2 hydration through a mechanism where Zn is bound to hydroxide. The reaction takes place in four stages: (1) The deprotonation of water where Zn facilitates the release of a water molecule proton to generate a hydroxide ion. (2) The bonding of CO2 where the CO2 substrate binds the enzyme active site and positions itself to react with the hydroxide ion. (3) The nucleophilic attack of carbon hydroxide on CO2 where the hydroxide ion attacks the CO2 and converts it into the bicarbonate ion. (4) The water displacement of the bicarbonate ion where the catalytic center is regenerated with the release of HCO3- and the bonding of another water molecule (Figure 9). Thus, the binding of water to Zn favors the formation of the transition state, leading to the formation of bicarbonate and facilitates the release of the proton through the attraction of the two reactants to a close proximity (Stryer et al., 2008). Figure 9. Simplified configuration of β-carbonic anhydrase catalysis (Stryer et al., 2008). Carbonic anhydrase is involved in a variety of physiological processes (Figure 10) (Smith and Ferry, 2000; Moroney et al., 2001). Any change in CA activity directly affects the photosynthetic rate and CO2 fixation under limited CO2 conditions. Carbonic anhydrase is the only photosynthetic C metabolism enzyme whose activity fluctuates in a number of species with CO2 concentration changes in the environment. Its activity decreases rapidly into air bubbles at low CO2 emissions and vice versa. The functions of CA in photosynthetic CO2 fixation are: (1) In C3 plants, β-CA helps to raise the CO2 concentration in the chloroplast, which is used as a substrate by the RuBisCO enzyme, thereby increasing its carboxylation rate and thus participating in the reaction incorporating C2 into carbohydrates during photosynthesis where CO2 can be used only as C and not the carbonic acid or the bicarbonate ion. (2) CO2 hydration to form HCO3- is used as a substrate by phosphoenolpyruvate carboxylase (PEPC) in C4 and CAM plants. (3) CO2 diffusion through the plasma membrane and the chloroplast is facilitated. (4) Participation of active CO2 transport through the plasma of the membrane by converting CO2 into HCO3- is how C enters the cell (Tiwari et al., 2005). Figure 10. Simplified diagram of physiological processes involving β-carbonic anhydrase (Smith and Ferry, 2000; Moroney et al., 2001; Tiwari et al., 2005). In absence of the light phase of photosynthesis, energy sources to fix CO2 get depleted, while respiration continues and increases [CO2] by shifting the central reaction (Figure 11) to the right which diminishes pH causing inactivation of amylase and consequently, starch and glucose are not hydrolyzed any more, resulting in a decrease in the osmotic gradient causing the occlusive cells to lose water and swelling which makes the ostiole to close (Casson and Gray, 2008). Figure 11. Simplified diagram of the central reaction for stomatal closure. There is evidence that Zn deficiency reduces the CA content in some plants and that there is a close relationship between CA and Zn in plant physiology. By understanding the biochemical function of Zn in this type of biological macromolecules, the connection between the detailed biochemical and physiological functions can interrelate with genotypic and phenotypic expressions. Today, there are many available theoretical elements necessary to develop and implement new nutritional diagnostic techniques. Alloway, B.J. 2004. Zinc in soils and crop nutrition. International Zinc Association, Brussels, Belgium. Available at: http://www.fertilizer.org/ifacontent/.../1/.../2008_IZA_IFA_ZincInSoils.pdf (accessed November 2010). Ojeda-Barrios, D.L., O.A. Hernández-Rodríguez, J. Martínez-Téllez, A. Núnez-Barrios, y E. Perea-Portillo. 2009. Aplicación foliar de quelato de zinc en nogal pecanero. Revista Chapingo Serie Especial Horticultura 15:205-210.